#50 copper transitional pads used between metal and resin polish pad wet and with GM3000 grouting step during polishing. 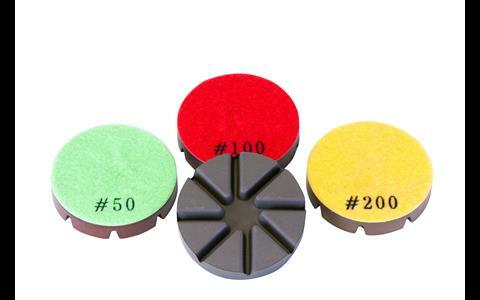 Set of 9 velcro backed polishing pads used on Husqvarna PG450 grinder. Rental fee is based on non visible or minor wear on pads, heavy wear will revert to replacement costs. * Please call us for any questions on our concrete polish transition 50 set of 9 rentals in Portland OR, Gresham OR, Milwaukee OR, and surrounding metro area.